Manila residents are excited about a new concept in camping called Glamping which really means a luxurious version of camping. Not many resorts in Philippines offer nice campsites for glamping. A good venue for glamping is a resort in Clark. 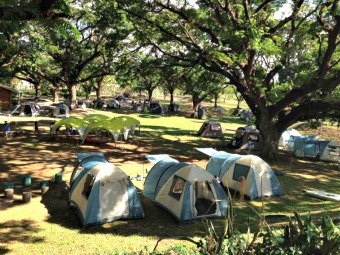 Camping is fast becoming one of the favorite outdoor activities for families in the Philippines, especially for residents living in crowded cities like Manila and Cebu. Modern camping gears makes camping a much more accessible sport for the less outdoor types in Manila. However, finding a good resort near Manila that offers facilities for camping is still a very difficult thing. Outdoor facilities - Good venues for glamping in the Philippines offer not only vast outdoor space but also a generally relaxing ambiance that enable campers to relax and unwind. Manila camping event organizers have discovered one resort in Clark Pampanga that is very suitable for glamping in Philippines. The name of this hotel in Clark is Clearwater Resort and it is located in one of the safest cities in the Philippines, Pampanga Clark Freeport Zone. Or you can contact this resort in Clark Philippines directly to inquire and book a venue for glamping in the Philippines. By the way, Clark Philippines has its own international airport, so for those living outside of the Philippines who are interested to go glamping in Clark, there are plenty of flights linking major cities around Asia directly to this Freeport City.